Quality taxi from Wakefield, Leeds, York, Selby, Goole, Doncaster. All our vehicles are purchased from Volkswagen in Germany and are hand-built to our specifications, which include GPS Satellite Navigation, so we will have no problem finding you. Each vehicle has air-conditioning, privacy glass, and is able to carry from 6-8 passengers. One vehicle has a card table for your games, and one of our vehicles has the Isofix system for securing child seats. 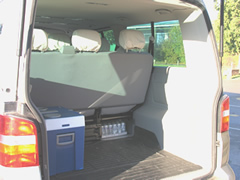 The vehicles all have a large capacity for carrying large amounts of luggage, including skis and golf clubs. It is our aim to provide a professional and friendly service to enable you to get your holiday off to the best possible start. 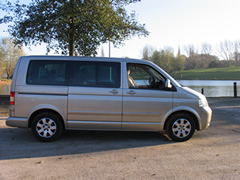 However many passengers you want us to carry (up to 8 in one vehicle - but we have several vehicles), to or from the airport, we can almost certainly help. As you can see, we are more than just a taxi firm. Whatever your requirements, we can almost certainly help. Just contact us and we'll be happy to answer any of your questions.